"This study describes a novel mechanism for aspirin's effect in delaying wound healing and suggests that aspirin should be used with caution in patients with chronic wounds," says Dr. Takehiko Yokomizo. In addition to its known capacity to promote bleeding events, aspirin also inhibits wound healing. New research now describes how aspirin acts on key skin cells called keratinocytes, delaying skin repair at wound sites. A better understanding of this process offers hope for the development of drugs to encourage wounds to heal. "This study describes a novel mechanism for aspirin's effect in delaying wound healing and suggests that aspirin should be used with caution in patients with chronic wounds," says lead author Takehiko Yokomizo. 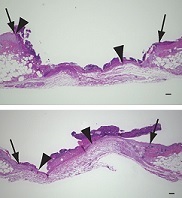 Illustration: Three days after injury, wounds are healing faster in diabetic mice treated with a synthetic form of BLT2 (bottom) compared with untreated mice (top). Arrows mark the length of the wounds, and arrowheads indicate the progress of epithelial restoration. –Liu et al., 2014.